George Soros has pledged millions to independent groups, "to ensure that the money spent on trying to re-elect President Bush doesn't overwhelm the process." CNN's exclusive daily wrap on all things political, will return January 5. CNN's Bill Schneider on Howard Dean's challenge to the Democratic Party. CNN's Candy Crowley on the importance of the Iowa caucuses. CNN's Jeff Greenfield on John Kerry's uphill battle. WASHINGTON (Reuters) -- President Bush's most-feared political opponents for now may not be Democratic presidential candidates, but a billionaire financier and anti-Bush advocacy groups with big-spending plans. "Liberal special interests, led by billionaire currency trader George Soros, are raising millions in soft, unregulated money to defeat President Bush," the Bush campaign says in an Internet posting. Bush has already raised more than $110 million for his primary campaign, in which he has no challenger, far outstripping any Democratic rival. Campaign spokesman Scott Stanzel said anti-Bush groups threaten to spend as much as $400 million, justifying the Bush primary-season goal of raising a record $170 million, largely through a network of major supporters who funnel donations to the campaign. But campaign finance experts say there is little chance of Bush being outspent. "The Bush campaign is raising money hand-over-fist. He has the aura of the incumbency and the power of the presidency. He's in the catbird seat," said Celia Wexler, research director of the Common Cause good-government group. Along with Soros, the Hungarian-born financier who has pledged $12.5 million to ensure "we can write off the Bush doctrine as a temporary aberration," another chief target of Republican ire are independent political groups such as the Internet-based MoveOn.org. The group has raised nearly $7 million to run ads attacking Bush, and launched an anti-Bush television-commercial contest which has drawn more than 1,000 submissions from the public. "They have the potential to do an incredible amount of damage," said Scott Reed, a Republican consultant with close ties to the White House. He said the independent groups could run "over the top" ads attacking Bush with political impunity, and there was little financial accountability. 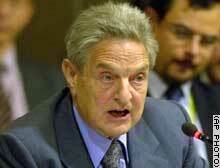 He suggested Soros may be seeking "payback" for the Iraq war, reflecting business interests in France and Germany. Soros pledged his money to two independent political groups -- MoveOn.org and America Coming Together. "My contributions help to ensure that the money spent on trying to re-elect President Bush doesn't overwhelm the process," he said in a Washington Post opinion piece earlier this month. Soros -- whose new book on the subject is "The Bubble of American Supremacy" -- said he was "deeply concerned with the direction in which the Bush administration is taking the United States and the world." The Bush team's fund-raising appeals sharply criticize such efforts and accuse the independent groups of raising money overseas. "To beat these billionaire liberals and the flood of foreign money they're encouraging, we need your help today," an e-mail solicitation read. MoveOn.org founder Wes Boyd said the groups accepts no foreign donations and defended the group's methods. He said its donors have no expectation of access to a successful candidate, unlike those who donate directly to a campaign. "There's no strings attached," he said. The Center for Public Integrity government watchdog group said independent committees from across the political spectrum have raised $32 million this year, although the Soros-backed America Coming Together had yet to report. Wexler said it was too early to judge how effective the groups would be. The Federal Election Commission is expected to issue guidelines in February on their political activity. Conservatives have also used independent political groups and are doing so again this year. "They're playing catch-up ball," after waiting for the Supreme Court's December ruling upholding the campaign finance reform legislation, Reed said. The conservative Club for Growth has run ads in Iowa and New Hampshire, where the nation's first major nominating contests take place, attacking front-running Democratic presidential candidate Howard Dean.